Looking back to the childhood of the universe. The images above, starting on the left and rotating to the bottom right, are successive magnifications of the same patch of sky, made using the Hubble Space Telescope. 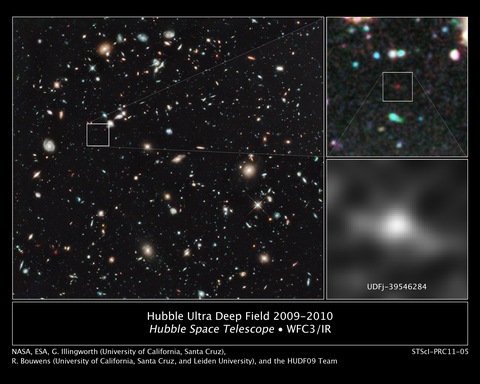 The blurred object in the bottom right photo is the most distant galaxy yet observed. It's about 13.2 billion light years away. Since the Big Bang was about 13.7 billion years ago, light reaching us from this galaxy originated within about half a billion years from the beginning of the universe, when it was in its infancy. More winter scenes from Brooklyn Heights. The storm that started Wednesday and ended early Thursday added another blanket to what had already accumulated and not melted in earlier warmer weather. Accumulation on tree branches was spectacular. From my window, late Wednesday morning. Trees arching over Montague Terrace, looking toward Remsen Street, Thursday. Ship's bell in front of Danish Seamen's Church, Willow Street. Corner of Hicks and Remsen Streets. Grace Church, Hicks Street and Grace Court. My state senator's message to Jets fans. To be a Jets fan is to be a believer. It’s to ignore the conventional wisdom or the odds, even logic. If you can wake up each Jets game day believing that this time will be different ... well, you can wake up believing anything. Jets fans start each season believing in the infinite possibility of a changed future. We begin each game believing in the limitless opportunity to shake off past failures and make today the beginning of something new and special. Inspiring words, indeed. And it struck me how true they would also be if you substituted an "M" for every "J" in that passage. Could the Senator also be a Mets fan? It would be in character to root for both "-ets" teams, both underdogs with long histories of breaking their fans' hearts. But for a New York City politician, at least one whose district does not lie entirely in Brooklyn or Queens (Squadron's includes lower Manhattan as well as a small part of Brooklyn), to come out as a Mets fan would be uncommon valor. There isn't nearly the intensity of contempt between Giants and Jets fans as there is between Yankees and Mets partisans. Yankee fans are a majority in three of the five boroughs, which is why Rudy Giuliani could proclaim his Yankee loyalty without endangering his chances in citywide elections, and why Hillary Clinton made the claim that she had "always been a Yankee fan", which she quickly qualified by saying she was a Cubs loyalist, but the Bombers were her favorite AL team. 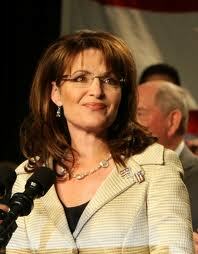 Palin free February? You betcha! Dana Milbank has made the challenge. I'll gladly take it up. After all, I've only posted about her three times. The first was in 2008, when she was a candidate for Vice President and I, like many, was shuddering at the "heartbeat away" prospect. Another was an apology. The third was here. Anyway, it doesn't seem that big a sacrifice for me.